A Filipina finally reunited with her daughter after 18 year of being apart. The daughter hidden under the name ‘Fatima’ is a Kuwaiti citizen determined to find her mother and with the help of media, she found her long lost mother. 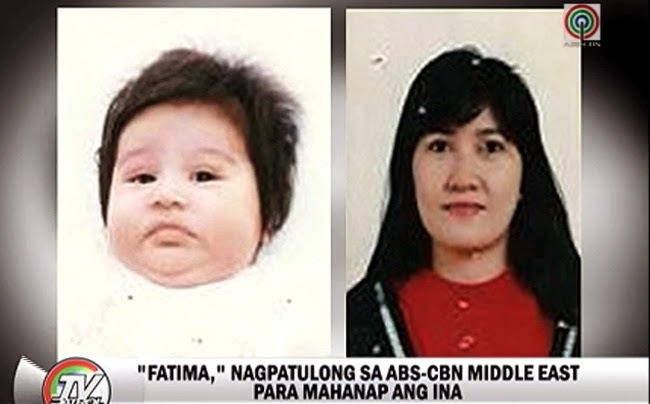 On December 10, 2014, TV Patrol of ABS-CBN aired Fatima’s message to her mother. She asked her to communicate with ABS-CBN if she ever sees the news as she deeply longed for her. Fatima asked the news team to hide her face as her life is complicated at the moment. Fatima is now a mother herself with a son and married to a Kuwaiti. She went to the ABS-CBN Middle East Bureau office and asked if they could help her find her mother named Evangeline. They had been separated for 18 years. ABS-CBN team found Evageline in Gumaca, Quezon. According to Evangeline, Fatima was 3 years old when she last saw her in Kuwait. Evageline said that her marriage with a Kuwaiti was good but when she came home to the Philippines to find a home where their family could stay her communication with her husband had soon faded and lost. Evageline shared that she had a nervous breakdown due to being away from her daughter. After seeing her daughter’s message on TV, she immediately contacted ABS-CBN and started communicating with her daughter. She was excited to be with her daughter and was teary eyed during their first phone call. Evangeline shared that this year’s Christmas must be the best as she will finally be reunited to her daughter after 18 years. Fatima will soon go to the Philippines to meet her mother for the first time after almost two decades of missing her.